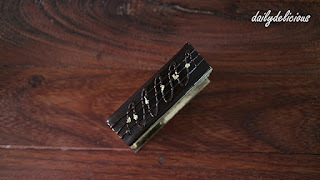 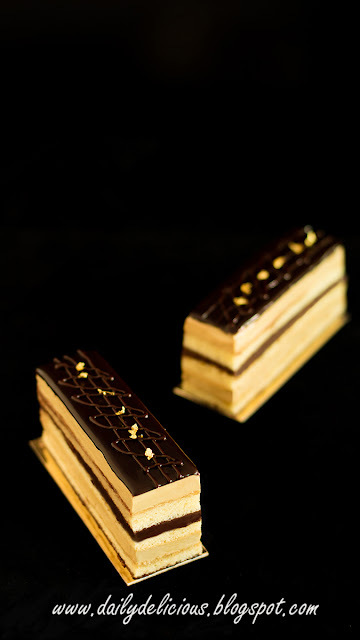 The first time that I made the Opera cake is about 7 years ago, that time I made pistachio opera cake. I'm not a professional trained chef, I just love to make all the things that I (and my family) want to eat ^^, it's the only reason that I keep on cooking and baking. 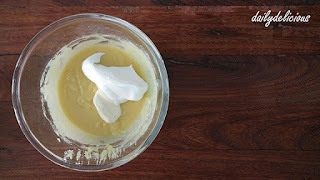 And every times that I make traditional recipe, I try to simplify it so everyone who love to bake at home like me, can create it at home too. 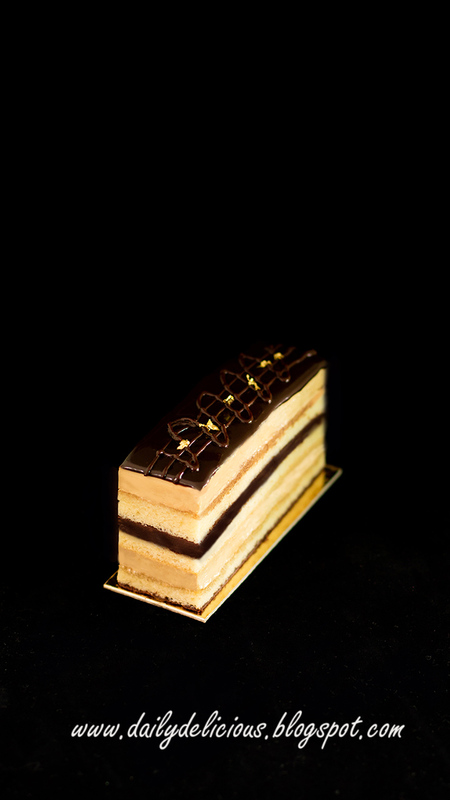 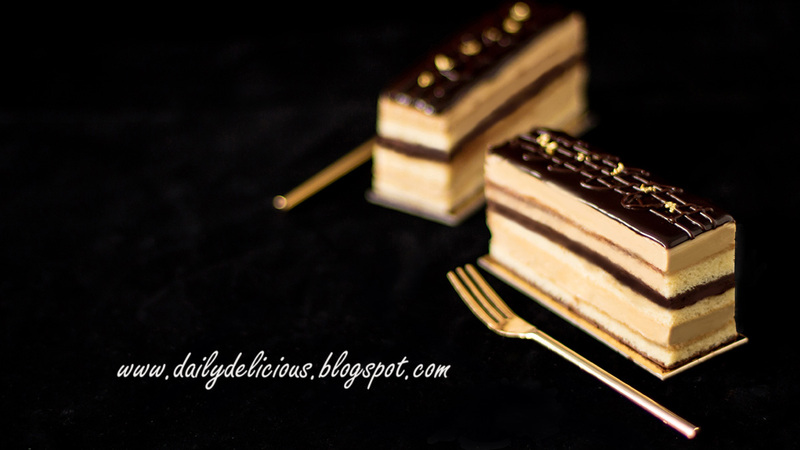 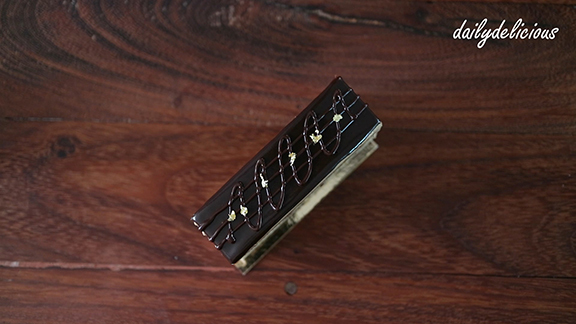 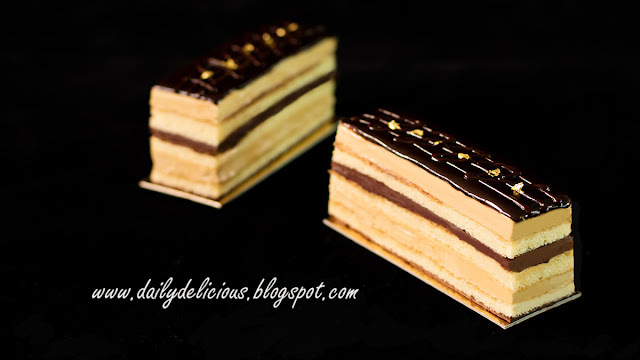 This time, I got a request, a classic opera cake, the one with simple flavor of chocolate and coffee. 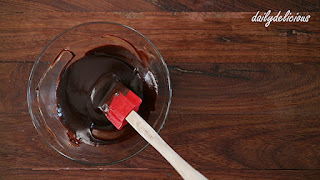 I really recommend you to use the chocolate that you love to eat, this time I use 66% chocolate, as I don't want it to be too bitter or too sweet. 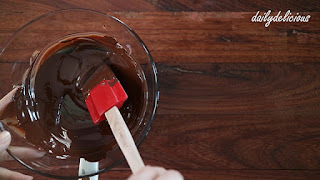 You can use the higher or lower percentage of chocolate but please remember that with higher one, the ganache will be firmer. 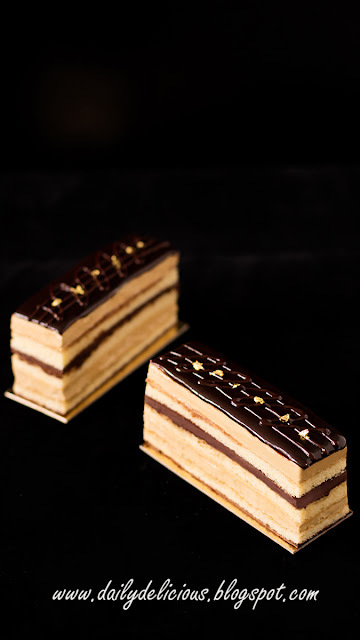 Three layers of Joconde biscuit with coffee buttercream, chocolate ganache, and chocolate glaze. 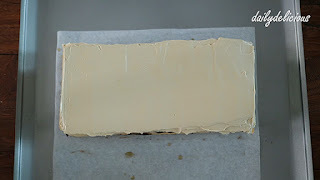 The first time that I made the Joconde biscuit, I made a mistake by baking it too long, so if you never made it before try baking it until set not dry ^^". 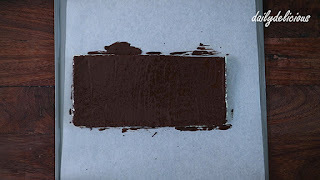 You can check by touching it lightly and it will spring back, the time that I give is only a guide, mine is only 8 minutes. 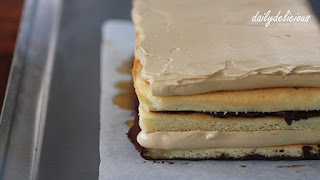 I think one of the easy point of this cake is, you will trim it into desired pieces, so you don't have to worry much about the glaze, hehe. Just make sure that the top of the cake is smooth as you will trim all the side anyway, easy, right? 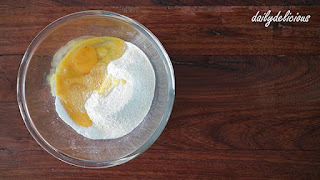 Other parts of the cake is simple, it's not hard to make but it takes time so prepare it one day before you planing to serve it. 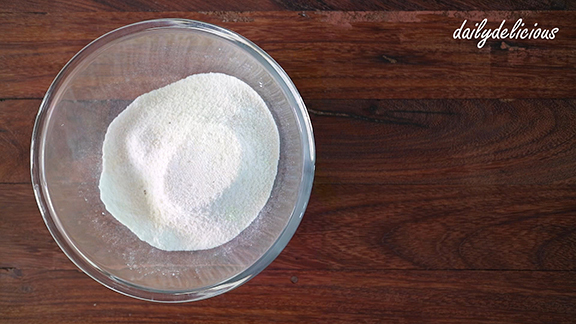 Sift almond, icing sugar and flour into a bowl. 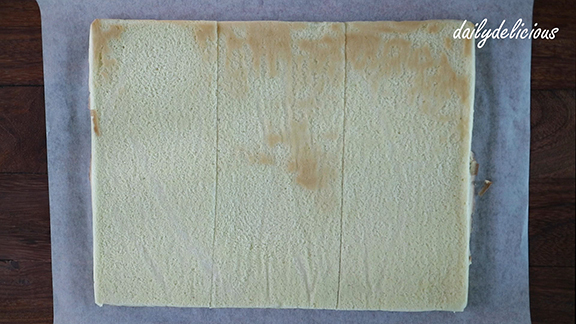 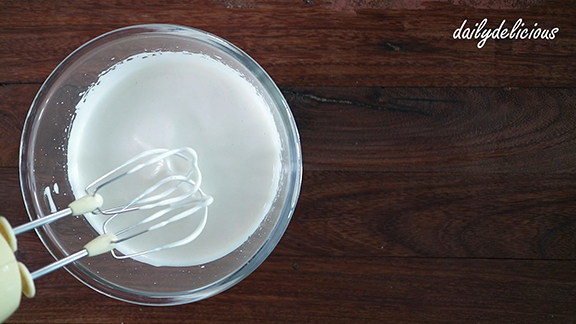 Beat the egg white with a pinch of salt until foamy, add the sugar gradually and beat until firm peaks formed. Fold into the almond bowl, in 2-3 addition. 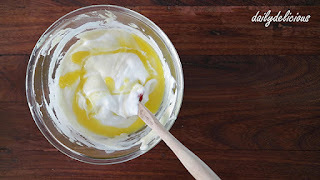 Pour the melted butter into the bowl. 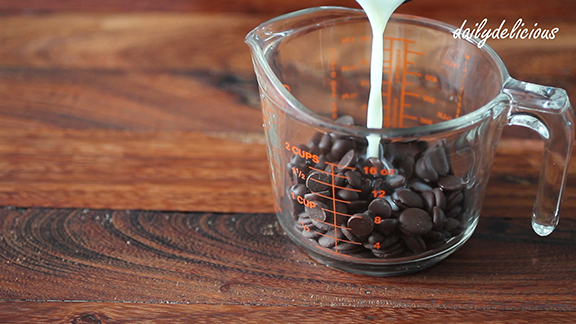 Pour into the prepared pan and bake for 8- 15 minutes, and let it cool completely before using. Put the water and sugar into a saucepan, and place over medium heat. 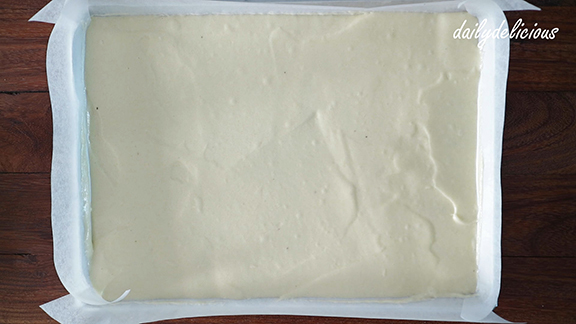 Heat until the temperature reach 115C. 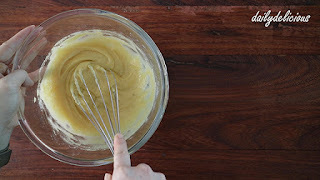 Meanwhile beat the eggs until thicken. Pour the hot syrup slowly into the the egg bowl, beat all the time. Beat until thick and cool. 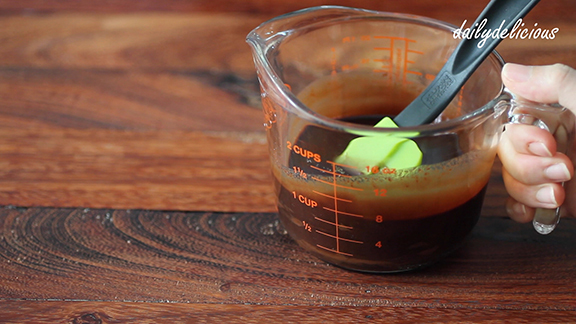 Mix the coffee liquor and instant coffee granules together. Pour into the bowl with a pinch of salt. Cut the biscuit into 3 pieces. 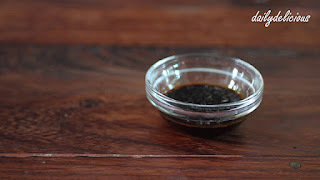 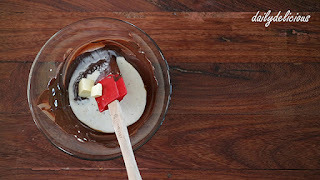 Make the base chocolate by put both chocolate and oil into a bowl, and place it over hot water. Stir until melt. 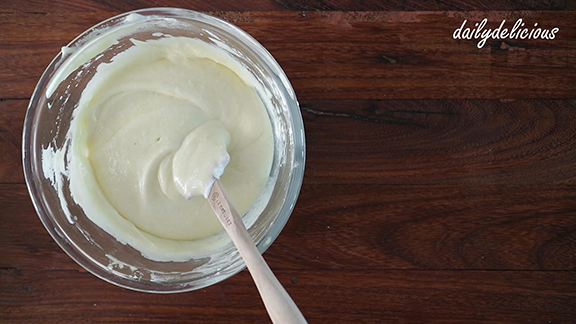 Brush it over 1 piece of the biscuit. Make the syrup by boiling the sugar and water together. 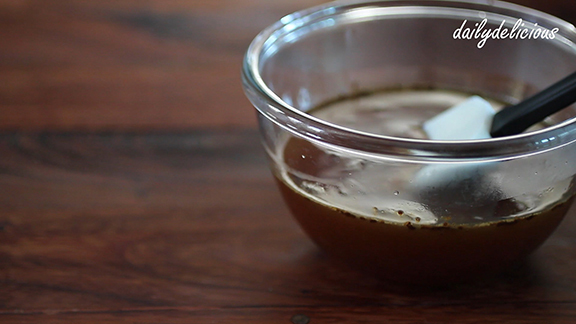 Remove from the heat and mix in the coffee liquor and instant coffee granules. 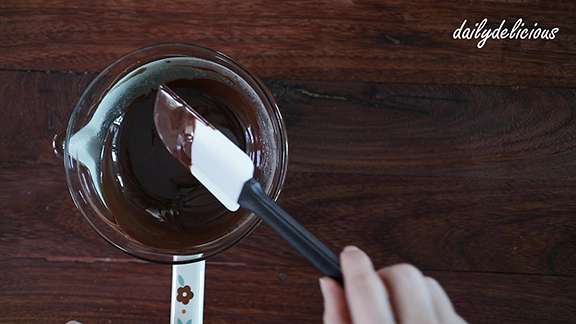 Make the filling ganache by putting the chocolate into a bowl, and place it over hot water. 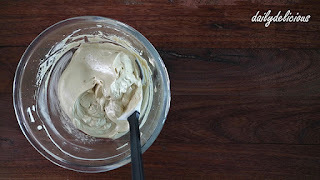 Warm the whipping cream until 50C. 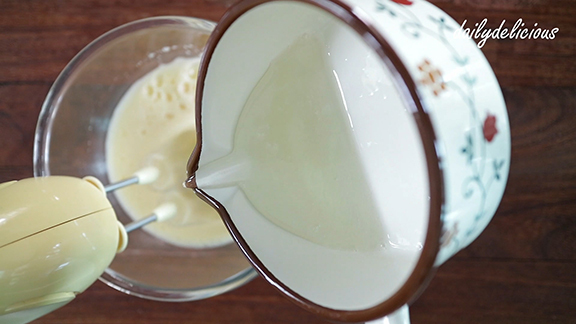 Pour into a bowl with butter and golden syrup. 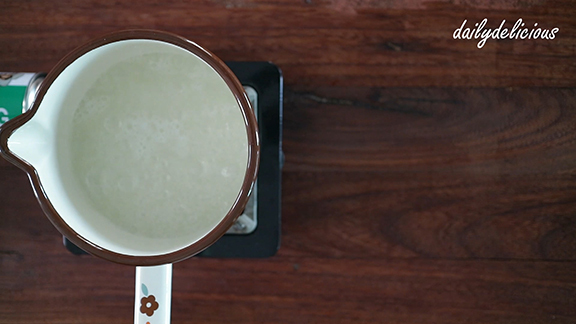 Stir to combine, let it firm up before using. 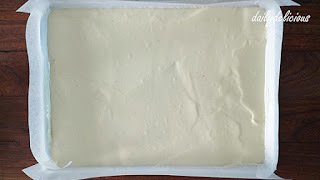 Spread the buttercream over the cake, then place another sheet of cake and sprinkle with the syrup. 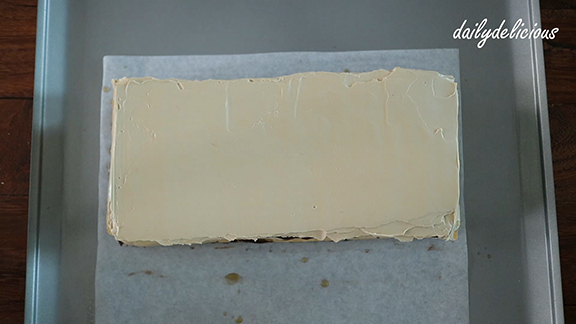 Then put the cake into the fridge until the buttercream harden. 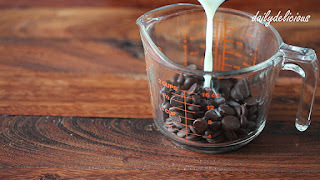 Bring to boil all the ingredients except both kinds of chocolate, then pour it over the chocolate and stir until combine. Let it cool. 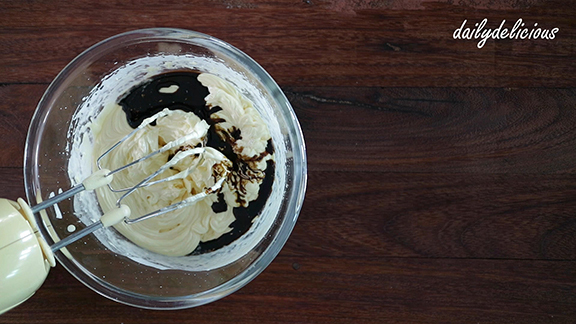 Pour the chocolate glaze over the buttercream, then return the cake to the fridge. 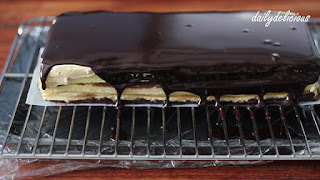 When the chocolate glaze firm, trim the cake and cut into desired pieces.